This entry was posted in Uncategorized and tagged 20 Lines A Day, aging, awe, child's voice, childhood memories, Haiku, ladybug, mom, personal story, poetry, praying mantis, respect for all living things, summer. thank you and a warm welcome to you! hi Cubby and a warm welcome to you this morning. mosquitos, since i got West Nile Virus last year. oops……yeah i guess that might be somewhat problematic huh? LOL. oh my goodness, i can believe it Rabirius. i’ve seen with my own eyes, the Mantis returning every morning. thank you for sharing that sweet story, and a very warm welcome to you. you made me smile seeing you on my pages, ty. Ladybugs are a special kind of splendor. In my country they are considered an omen of incoming guests to your house,if they go on your arm. so if one lands on your arm, that means you will be having guests, how cool. ty, yes they always occupied a special place in my heart too. it is, i can’t recall…. Memories of childhood, being lifted up on the counter.. how little things are kept as precious and remain with us for so many years…as is the lady bird verse, it brought back innocence and childhood and wonderment of little creatures- thank you. memories are there, waiting for us to remember them, and you are most welcome. lol, you are so right on both counts…i haven’t met a human yet who doesn’t! ty. Not seen many ladybirds (well that’s what we call ’em) this year; at the moment we have loads of craneflies though. Nicely observed poem HA. ‘ladybird’, i wonder if that is a regional thing, i’m originally a NY’er and now in Illlinois and it’s ladybug here too. i’ve had several commenters call them ladybirds though. ty so much Tony, i really appreciate the encouragement. love the compassion in this..your mom obviously taught you well…we have enough…i like the humility in that as well…there are many who would never have enough to have this kind of heart…smiles..
thank you Brian for that sentiment, yes, mom taught me early. she ended up teaching herself to become the neighborhood veterinarian in our poor neighborhood in Brooklyn, she was able to birth a baby with what she knew too before the ambulance arrived. Thank you for sharing a piece of your past with us, nice work! Oh yes, I’m wearing it proudly lol! It’s lovely to be able to think fondly on our past moments I’m glad you got that experience! glad it fits!, i’ll be over shortly…..
My grand-daughter, she two and I will read this to her in just a while, because she is a ladybug, or so she says! i would love a follow up report, ty for that, kinda’ made my night…. oh thank you so very much and a warm welcome to you.it’s so funny that you mention reading this poem for children, one of my WP friends just tonight said he would be to his 2year old grand daughter. Enjoyed the lady bug..I once heard it was good luck to behold a lady bug..there is something special about them and I think you captured it well. well thank you Truedessa and a warm welcome to you. they always felt like a lucky charm to me, and i’m not sure that color is duplicated in nature very often. What a lovely poem of rememberence ~ taking the little lady bug and spinning your mind through time ~ happy time ~ thank you. 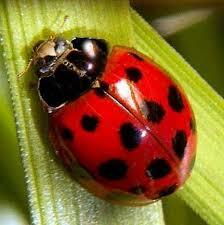 I’ve always loved ladybugs. I think of them as good luck. This is a lovely poem. ..well thank you Kirsten and the warmest of wekcomes to you….yes, i think they are considered good luck omens, i’ve just always been fascinated with their incredible color…its not reproduced in nature very often..
wchk, a very gentle poem. I love to watch the ladybugs while they crawl on our sunflowers. As an “amateur entomologist” I know that lady bugs eat other insects, such as aphids, which is perhaps is what she was doing-eating the aphids that were eating the leaves, Still the story is precious. that you cared about a living thing, even an insect. I did too, even as a child, and it sparked my interest. Praying Mantises are on of my favorite insects. They are the only insect that can turn their heads!. They are carnivorous, and it is difficult to watch them eat bees and butterflies, but I have to let nature take its course. I have seen a butterfly struggle so hard that it had pulled the leg off of the mantis-thus escaping. A mantis goes through “instars”, shedding its exoskeleton as it grows and its claw will actually grown back,, though most don’t have time to grow back to their full size. Years ago, when there were more gardens in my neighborhood and thus more mantises laying casings and living out their lives, I started marking them with craft paint at about the 3rd instar-this is when you can start telling a male from a female (females are larger and have a wider abdomen).and when I saw them molt, I would re-mark them-I knew “which mantis was which” in quite a few, of them, even as they grew. I would mark the casings the females made (they look like tan Styrofoam, are attached to a plant stem and hold next years eggs). Thus, I would know that these babies who drilled their way out of the casing the next spring ( it looks rather like wood shavings) belonged to which mom. Of course, i could not trace them after that-I had to be satisfied that “maybe” they were hers because they hatched near her casing and don’t travel far when their is adequate food. It is not true that female mantises always eat the male after mating. Only males who “dismount” wrong from a hungry female after mating meet this fate. (This is also true with black widows). what a fascinating lesson , i learned so much about the life of mantises today, ty for that beebee. and yes, i’ve never fogotten the lessons my mom taught me, such deep respect and admiration for all living things. i absolutely think you should blog this fascinating science lesson, i think folks would be as amazed as i was to learn all these details. thank you again for always reading my words, it means a lot to me. Love that story. Thank you for sharing that sweet moment of your life. she sparked that mantis memory which i hadn’t thought about in decades. ty, hitandrun, ty so much. I really love this poem! I wrote a somewhat similar one years ago about a “little green bug upon the picnic table”. Thank you for sharing. hi Jenifer, ty…fascinating that so many poets have written about insects, isn’t it? the little ladybug ressurected that memory for me! that in me and i’m forever grateful. and ty, i guess it is kinda’ zen.lol! Wonderful stuff, WC, thanks for reposting. I always feels so blessed when a ladybug (or any creature) chooses to land on my shoulder. That trust is a surprise gift, as are your poems. Have a wonderful week! a little, they are so odd when you really look at them closely. you are a sweet friend Christy, ty. i’m so glad we connected. Hmmm…I thought I read and commented on this the other day… weirdness. oh it’s a reblog from the summer, maybe you already did. I will comment on your artwork-poems separately. spend some time on your blog tomorrow. this is only my third poem/artwork pairing. hi F.G.M and a very warm welcome to you. i’m so glad you enjoyed this poem, the experience was so sweet i just had to share it. ty for taking the time to write such a wonderful comment, and kind regards from Chicago! love the natural harmony your poem espouses here.